Author, antiquarian bookseller and rare photography dealer Jacob Loewentheil is no stranger to the trade. He grew up learning from his father, Stephan Loewentheil, president and founder of the 19th Century Rare Book & Photograph Shop of Maryland and New York. 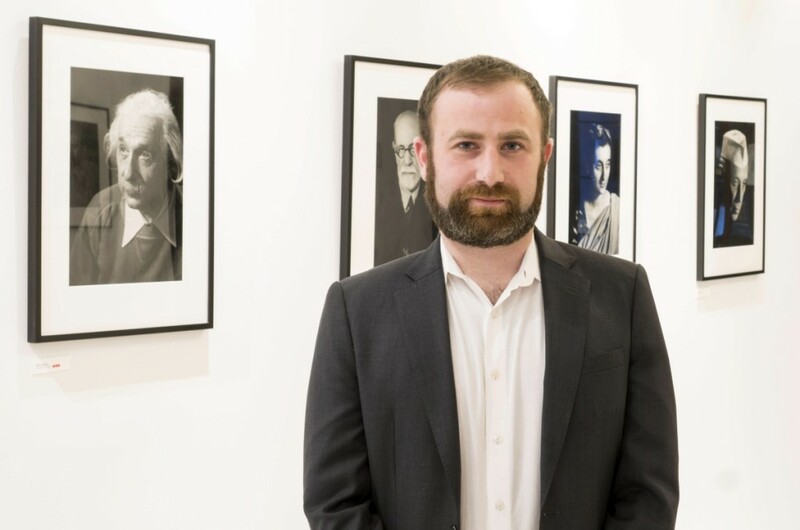 A psychology major at Cornell University, Jacob was ineluctably drawn to the probing portraits of Marcel Sternberger (1899-1956), a refugee from war-torn Europe who photographed some of the planet’s most famous people, Franklin Delano Roosevelt, George Bernard Shaw and Sigmund Freud among them. Excerpts from Sternberger’s unpublished manuscript and interviews with his subjects accompany the 206 beautifully rendered images in Jacob’s first book, The Psychological Portrait: Marcel Sternberger’s Revelations in Photography, published by Skira Rizzoli in 2016. A related exhibition, “The Photographs of Marcel Sternberger: Portraits of the 20th Century” is on public view October 6-November 3 at the Sidney Mishkin Gallery at Baruch College, 135 East 22nd Street in New York City. Jacob is currently delving into the travel diaries of British photographer Thomas Child (1841-1898), best known for his late Nineteenth Century views of China. How did growing up in the antiquarian book trade shape your interests? It took me a long time to learn that anything had been published or made after 1900. I remember being a child and my father showing me a Shakespeare Folio. Even then I knew it was special and begged him to keep the tome and not sell it. To this day, my walls are covered with what some would call oddities – among them, a large-scale orotone from the opening of the American West; a giant Chinese silk map of Beijing, the Forbidden City and imperial garrisons from circa 1830; and a set of two paintings of Arabian men I bought for a dollar each when I was 6 or 7. How did you discover the Sternberger trove? About five years ago, I was looking through some closets full of material, the result of years of my father’s collecting of historically significant works. I found a group of boxes with pictures of everyone from Einstein to Frida Kahlo, as well as unpublished written works, ephemera. It was a whole life. I immediately thought the work had tremendous value – historically, technically and artistically. I asked my father if he thought I could do a book on the man who created the archive, Marcel Sternberger. We quickly agreed it was an idea with high potential and I set out to organize, digitize and ultimately write a book about Sternberger’s work and life. What most interests you about these images? 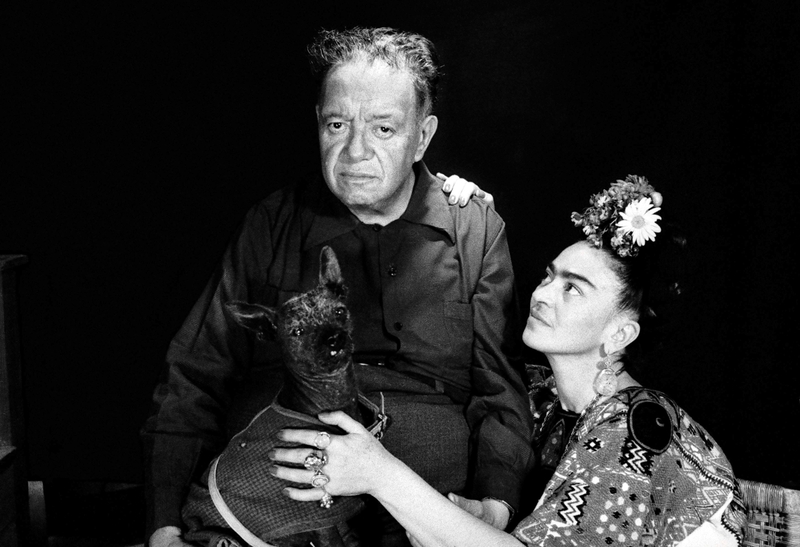 “Diego Rivera, Frida Kahlo and Frida’s Chihuahua, Mexico, 1952” by Marcel Sternberger. The fact that these photographs were all taken with a handheld Leica 35mm camera. It’s unbelievable that Sternberger created beautiful, intimate images of some of the last century’s most profoundly important people with one or two lights and a plain backdrop. These images surpass those of others who were working in a similar vein, but with much more equipment and with negative enhancement. In what ways was Sternberger of his time? Apart from his time? Sternberger was chased across the globe by fascists due to anti-Semitism in years leading up to World War II. So his documentation is inescapably bound up in his circumstances as he moved about the world. The two things that most set him apart from his peers are his use of a handheld camera and his strict realism. His portraits reveal facets of these giants of thought and art that have never before been seen, but only by eliciting true emotions through interviews, and only taken with a Leica as he circled them. What do you love about the portrait, illustrated here, of Diego Rivera and Frida Kahlo? It tells a more complex story than history would have us believe. Diego is often seen as a callous philanderer, but this portrait tells a different, subtler story. In my book you can read excerpts from a secretly taped interview with Rivera where he tells a history of his marital life far different from the one handed down to us. Another favorite image is one of Albert Einstein in his suspenders. Seeing history’s greatest scientist so intimately revealed is a treasure. Besides your exhibition at Baruch College, how are you exhibiting these images? There may be something in the works for the AIPAD Photography Show, planned for April 4-8, 2018, in New York City. Other than that, stay tuned and visit our website, at www.sternbergercollection.com. What will become of the Sternberger archive? There is much more scholarship to be done, whether by me or another person. Ultimately, it is my intention that the archive find a home where it will be appreciated and guarded for future generations.